The best approach is to follow a circular 3 step process: Evaluate, Plan, Train. This is the most important step in the process of problem solving. It is also a step that is commonly skipped or overlooked. You cannot solve a training problem if you don't understand what the underlying issue is. Don't get in a habit of saying "my dog can't [weave/drop] in public" or "he knows how to [weave/drop]." Those statements will prevent you from diagnosing and ultimately solving the problem. It's important to videotape all your training sessions and performances so you have access to data for review. If you don't have videotaped sessions or performances, make that part of your routine. You will become a much better trainer when you review your videos. Watch your dog in the video. Don't focus only on the mistake — also look at your dog's behavior before the mistake. Is there any confusion or stress in his expression? Is your dog focused? Is your dog slower or faster than normal? How quickly does your dog respond to the cue? What behavior – if any – happens when the cue is given? Drop on recall example: Does your dog's expression change as you give your cue to drop? How is your dog's speed before that cue? What behavior occurs immediately when you give the cue to drop? Does your dog's head dip? Is there a change in speed? Weave entry example: Is your dog focused on the entry as he moves toward it? Is he too focused on you? Is he focused on other obstacles? How is your dog's speed as he approaches the weaves? Too fast? Too slow? Watch your handling. Is your handling supporting the performance? Are you helping or attempting to control your dog's behavior? Is there extra prompting from you that might be confusing the dog? Is there confusion between this cue and another cue? Where are you looking? Are you connected with your dog? Drop on recall example: What does your signal look like or how does your verbal cue sound? Are you holding your signal in a stopped position waiting for the drop? Does the cue look forced or sound demanding and loud? Is there extra movement of your upper body or head as you give the verbal cue or signal cue? Is there any other movement forward? Are you acting differently? Weave entry example: How much are you moving? Are you supporting the entry? Are you trying to help your dog with the entry? Did you set up a good line to the weave from the previous obstacle? Does the issue happen mostly with you on a certain side? Or when your dog is on the opposite side of you in relation to the weaves? Do you always have to be in a specific spot for your dog to be successful? Is there an issue with the environment? Distance? Distraction? Obstacle or ring setup? Drop on recall example: Is your dog's drop performance different in certain environments? Is your dog more distracted with the judge? Is the drop performance better when the distance is shorter? When the drop is cued earlier or later? In a quiet environment or a busy environment? Weave entry example: Does the dog's weave entry performance deteriorate when there is a tunnel after the weaves? Or if he is on a fast line before the weaves? What if he comes toward the weaves from an extension obstacle, like the triple or double? Does he make more mistakes when the spacing before the weaves is increased? Or decreased? What about coming toward the weaves from a tunnel? Does it happen more often when there is ring crew sitting near the weaves? Or when the judge is closer to the weaves? Or when the weaves are too close to the edge of the ring? Once you have evaluated both you and your dog's performances, you will need to create a training plan to address the one or more areas that need training. If you have handling issues, plan how you will address those separately from the dog training. Break your dog training plan down into very small pieces of training so that your focus is on individual behaviors that require change. Set up the training plan based on your evaluation. Do not over complicate the training plan by adding more complexity before or after the specific behavior you are addressing. Determine where you will train, when you will train, how you will set up the environment, and what reinforcement strategy you will use. If you are changing your handling, work on that without your dog. Even though it might feel strange, it's important to videotape the training of you, too. Your handling will improve dramatically when you work without your dog. Do not add the dog until you feel confident about your handling change. When you train your dog, keep your sessions short. Depending on the age and experience of the dog, the total time to train in a session should be anywhere from 2-5 minutes. And that includes time between repetitions and any play or reinforcements you incorporate into that session! Set a timer if you tend to go longer than planned. After each training session, repeat the previous steps: Evaluate, Plan, Train until you have a well-trained and generalized behavior. If your training was done at home or in one location, you will want to go to different places or add different setups or sequencing to the training. As you add more distractions or sequencing, keep your dog's confidence high by changing no more than one thing. Start simple and build on success as you change the setup. When you follow these steps, your training mechanics and your eye for detail will improve. Spend most of your time evaluating and planning your training. That will make your training more efficient and will ultimately solve any current or future training problem. You will become your own training coach and you will avoid many potential performance problems as you make this a part of your routine. Click here to take our quick quiz & see what you've learned! Have a training problem you're struggling with? Nancy is offering her class Problem Solving for Open and Utility in the December 2018 term! Nancy Gagliardi Little has been training dogs since the early 1980's when she put an OTCH on her Novice A dog, a Labrador Retriever. Since then she has put many advanced obedience titles on her dogs, including 4 AKC OTCH titles, 6 UD titles, 3 UDX titles, and multiple championships in herding and agility. Nancy draws from her experience training and competing in multiple sports, which has given her insight into innovative and creative ways of training and handling dogs. 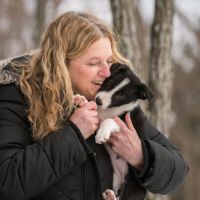 She finds that most trainers have no issues training the "big picture," but they tend to lose sight of some of the little details that are the building blocks to the communication and the relationship between them and their dogs. She loves working with very different challenges and trying to help people find a way to improve their communication with their partners. Over the years, she has moved from a more traditional obedience training background towards reward based/positive methods in training dogs in all areas. As a result she understands the challenges faced by "crossover" trainers and dogs, and can help handlers find their way to newer and more positive training techniques.